Viking Vets - Ultrasound - Your local vet based at Chevening, Station Road, Henbury, Bristol BS10 7QQ. Ultrasound is a method of looking at the internal ‘soft tissue’ organs of the body. It is a non-invasive means of visualising organs such as the heart, spleen, liver, kidneys and bladder. Ultrasound uses sound waves to create an image. 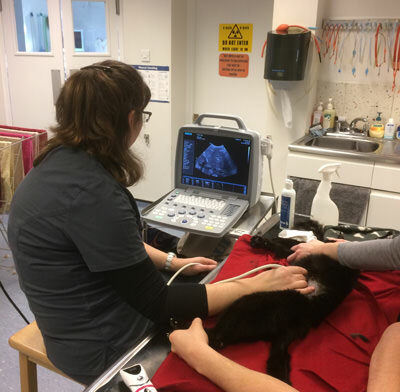 Ultrasound has been a great advance in veterinary medicine as it allows us to visualise the abdominal contents without surgery. During an ultrasound scan, the patient is placed on a table and gently held. An ultrasound probe, which looks a bit like a microphone, is held against the part of the body being imaged. The probe transmits and receives ultrasound waves, and a computer then analyses the waves and builds up a picture of the parts of the body that are being investigated. This examination is often performed conscious, although a mild sedation may be indicated if your pet is anxious or wriggly. Advanced Ultrasonography - In addition to the practice ultrasound, we are very fortunate to have a visiting specialist, Maggs Costello MVB, DVR, Dip.ECVDI, MRCVS. RCVS and European Specialist in Diagnostic Imaging. This allows a specialist scan to be performed at the practice without the need for travelling. Maggs' advanced skills and ultrasound equipment give a greater picture of the internal organs and enables the collection of biopsies or samples if required.